When it comes to kids and money, my teaching has always been the same – it should be more about “teaching lessons” than about the actual money. A very good way to teach your kids about money is opening a bank account. It’s very important to involve your child in the process. You probably have a good idea what kind of account would work best for your child, but why not have them do some research and learn some principles along the way? Feel free to read this post along with your child. I hope it is a good starting place for you. How Old Should My Child Be to Have a Bank Account? The answer to this question is…it depends. This is entirely up to you as a parent. Some parents open an account right when their child is born. Others wait until they are old enough to understand saving. Some wait until their child has their first job. Most banks and credit unions will not allow a minor (under 18) to open an account on their own. If your child is a minor you will need to open a joint account with both of your names on it, or open an account in your name (parent) only. When it comes to personal banking for young people, I tend to lean towards credit unions. This is because of one main reason…cost. Generally Bank accounts cost more than Credit Union accounts. For young people with very few transactions, saving a $10 monthly fee can make a huge difference. This isn’t the case in comparing every bank and credit union, so make sure you do your homework. Savings accounts are generally used as accounts where you want to accumulate funds. These accounts are great for using with a savings goal such as a car, college, or other large purchase. Interest rates on savings accounts are generally higher than checking accounts. If you plan on making withdrawals from your account on a regular basis, then you may want to consider a checking account. Checking accounts are great if your child plans to have several deposits and withdrawals on a regular basis. Most checking accounts come with disbursement tools such as: 1) checks, 2) debit cards, 3) online bill pay, etc. You will want to consider using all or some of these tools with your child. It’s a great way to teach them budgeting and money management skills. You can read my thoughts on using credit/debit cards here. You can also use both. This may prove to be your best option. Using both provides you tools to save (savings account) and spend (checking account). No Monthly Fees – You will want to find an account with no monthly fees. Anything less will deplete your savings. Low Initial Deposit – This is the amount you have to keep in your account at all times. As a rule of thumb, the industry norm is $25. So avoid accounts with a higher minimum requirement. Online & Mobile Banking – this is the future – really the present…what bank doesn’t have online access these days? Your bank should have these features. FDIC/NCUA insurance – You will want to make sure your funds are insured. Most large institutions will be insured, but you will want to definitely ask the question. Interest Rates on Savings – Now in 2014, this is really a non factor. But as interest rates rise, it is important to compare interest rates on your savings. Free Checking – This is my “silver bullet” because you can get most everything noted above with a free checking account from your local credit union. This is my recommended account. You will still want to ask the questions, because sometimes “free checking” means something other than “free” to some banks/credit unions. 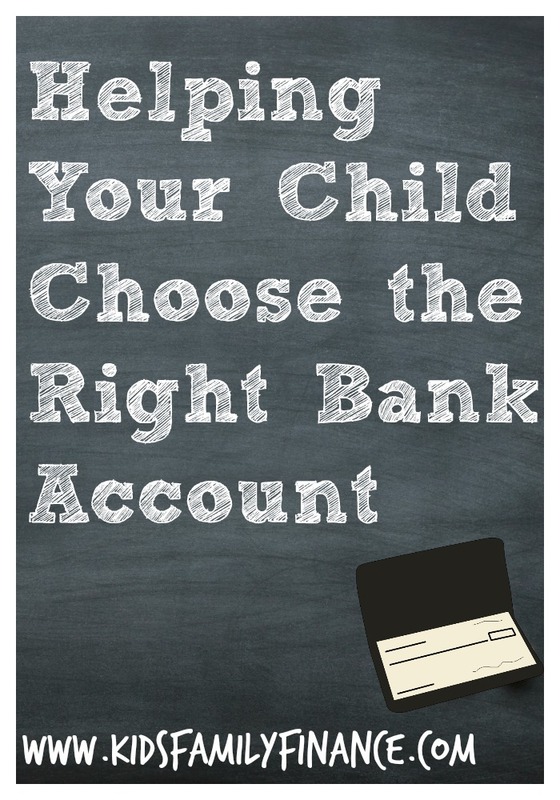 I hope this resource is a good starting point for you to help your child choose the right bank account. As I mentioned earlier, this can also be a great time for you to teach your child many great lessons that can prepare them for adulthood.